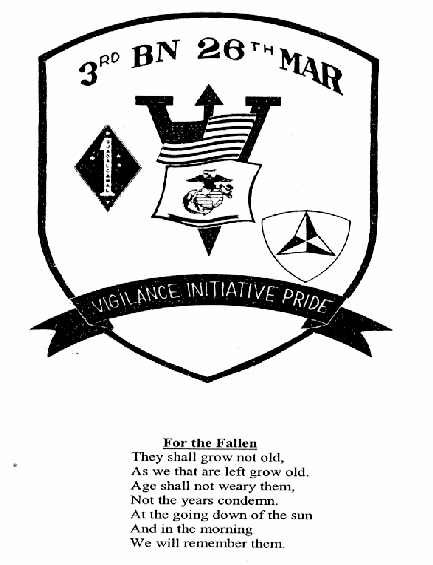 I was looking through your magazine that I just received and found a patch for 3/26, since I was with BLT 3/26 when it was formed in Dec 1968 at the Rock Crusher on the backside of Danang the reverse side of the hill that the 3RD MARDIV Headquarters was located and then we went afloat until July or Aug 1969; I am not sure of the month. 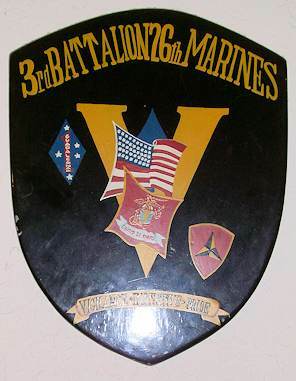 One of the GySgt from the battalion rotated to Okie and had this shield made up for those of us that wanted one. He told me he took it from the old 5th Marine Div logo. I have attached some pictures of the shield that he had made I got from him when I went through Okie on my back to the states. Compare it with yours and let me know if you can tell me if my shield is close to the original. Thanks for your email and catalog. P.S. 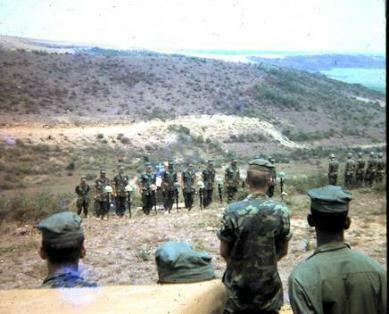 I am also attaching a picture of myself taken while I was on operation Oklahoma Hills in 1969, just thought I would throw it in after seeing the picture in this copy of your magazine. 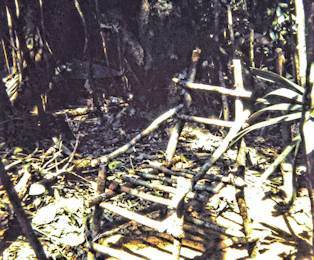 I am sitting in a chair that I made from tree branches and wire from C rations boxes. There are two of them 1-15-2011-004 and 1-15-011 006, number 004 I am sitting in the chair drinking C ration coffee and 006 is just the chair, hope you get a kick out of them, I have thinking back on what we use to do just to feel normal. ones underlined were my buddies. 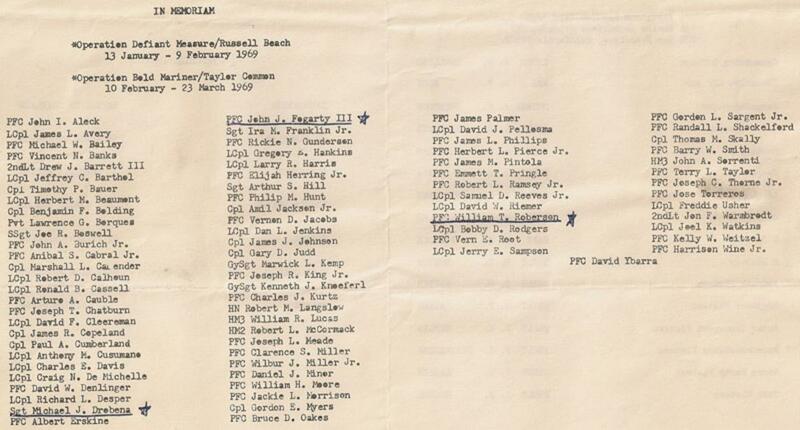 The below article was sent in to the Sgt. Grit Newsletter by Sgt. Chuck Bean of BLT 3rd Battalion/ 26th Marines. The 3/26 BLT Shield originated from a contest by the Battalion Commander at the time, Colonel Peyton Robertson. There were numerous entries and the Colonel chose the design presented below. 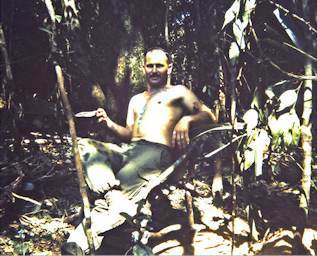 Joe Blaile sitting in a chair that he made from tree branches and wire from C rations boxes while on Operation Oklahoma Hills. The chair Joe had made. 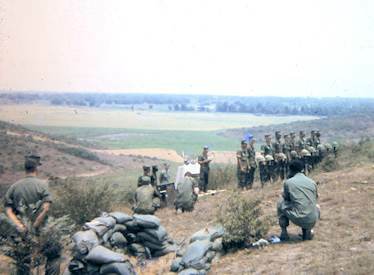 Memorial service on Hill 55 in April of 1969 for operations conducted 13 Jan 1969 thru 23 March 1969 for the operations listed.